Take 6-9 cups of water in a vessel and boil it well. Add salt in water and boil it. Add sevai when it boils well and add 2 drops of oil to prevent sticking. Allow it to boil for 7-10 minutes. Drain the water from sevai and rinse with cold water. In the mean time,heat oil in a wok and add mustard and urid dal. Add channa dal,red chilli,green chilli,hing,ginger and curryleaves. Now, add carrot and beans and fry it well. Add little salt if you want here and add turmeric powder. Add little water to make vegetables cook or it can be steam cooked. 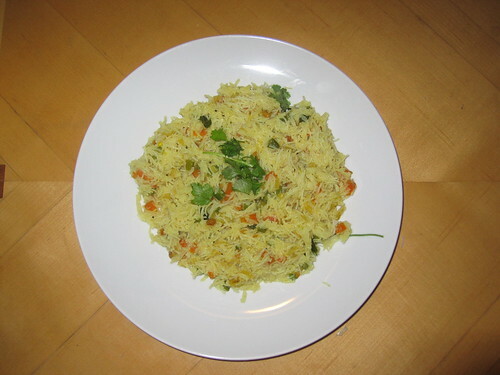 Add sevai, after vegetables cooked and mix it well. Switch off flame,add lime juice and coriander leaves when it is warm. Now,delicious plate of vegetable sevai is ready. 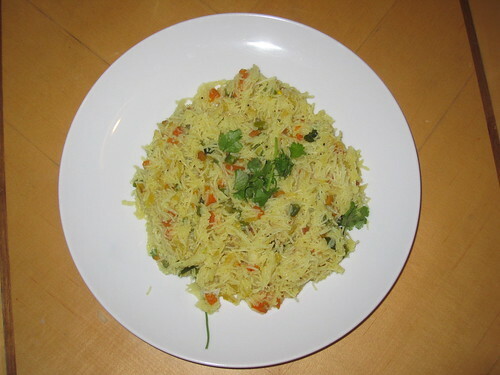 Hot plate of vegetable sevai can be served with any type of chutney. This an excellent vegetable dish. I love the flavors. I love Indian food,love the different spices and how most of it are made using vegetables.Sevai is new to me and I'd love to try this soon,I came across your site from the foodieblogroll and I'd love to guide Foodista readers to your site. I hope you could add this Foodista widget at the end of this post so we could add you in our list of food bloggers who blogged about recipes using lemon, Thanks! what a delicious blog! here is so many uncanny inspirations!